"Surfing USA! : An Illustrated History of the Coolest Sport of All Time" has many pictures of surfing memorabilia including a label from Hawaiian Girl canned pineapples depicting a surfing girl of days past. Catch a wave, and you're sitting on top of the world, the Beach Boys said. No kidding. No one who's tried it will ever forget the hurtling mojo of sliding down the flank of a rumbling water monster, even those of us who hung up our boards long ago. "An Illustrated History of the Coolest Sport of All Time"
It's the coolest sport ever, and it's equal opportunity. Just you and the ocean and the yin/yang of interstellar gravity and fluid dynamics. Way cool. Even though surfing was invented and perfected right here in Hawaii, it almost died here, thanks to missionary huffery. 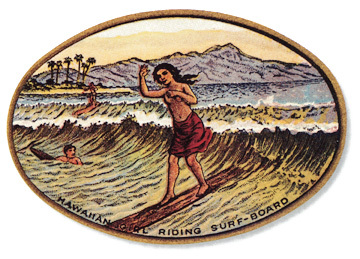 If it weren't for some radical Hawaiian watermen at the turn of the century -- Duke Kahanamoku foremost -- the sport would have died out completely. Luckily, Duke was cutting moves at the same time Hawaii became both a tourist dream destination and a pop-culture fixture, and images of mighty Hawaiians gliding among the glassies became an international icon of island life, along with hula maidens and uke pluckers. » The development of strong, lightweight boards that were the product of science as much as art. 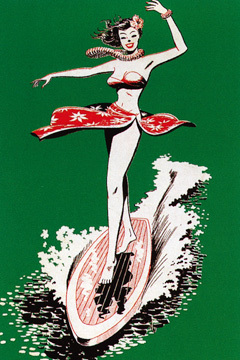 A Surf Queen from the 1950s. We'll get back to these later. The impact of surfing on American culture is wonderfully -- lovingly -- detailed in Ben Marcus' "Surfing USA!" likely the first book to treat the sport as a serious cultural phenomenon. Marcus, a journeyman editor for surfing publications, has mined the intangibles that make surfing cool -- the freeness of spirit, youth and rebellion, the respect for nature, the Zen-like concentration that doesn't translate well to dry land, the spillover into pop culture such as music, the movies, fashion, comic books, the language. It's quite a ride. The book is well-illustrated and written with a wry sense of humor, a half-smirk at the absurdity of the universe, a feeling for place and time and interconnection. The scope is America-wide and not Hawaii-centric: "Surfing USA!" is not an encyclopedia of surfing trivia. The book, for example, makes no mention of Rell Sunn. That hurts, but let's get real: Rell meant more in Hawaii and to pure surfing athletes than she did to surfing "culture." And this book is more about the culture than about the sport. Marcus gives "Gidget" full credit for unleashing a tsunami of surfing interest. Not every cultural craze can be traced back to a single source, but Fred Kohner's thinly disguised coming-of-age novel about his real-life teenage daughter Kathy's flirtation with beaches and boards was a monster hit. We're still hip-deep in the backwash, half a century later. With any luck, serious examinations of surfing as a social and cultural phenomenon will resonate in Hawaii. There is still no serious exhibit or museum devoted to surfing in the islands. The sport may have been born here, but it left home to grow and thrive. That's a bummer, dude. Much of the American surf culture was derived from the 1959 movie "Gidget" which starred Sandra Dee. 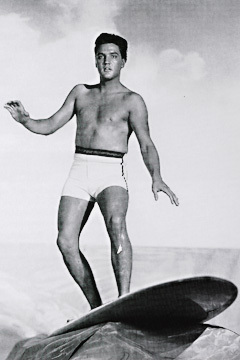 Elvis also helped cultivate the surf culture with his movie "Blue Hawaii."